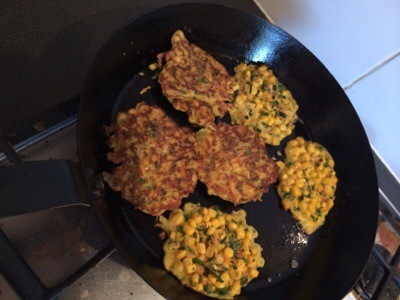 Home › Dinners/Suppers › Rosie and shirley ..
Two types if inspiration tonite..
First one being from a cook book my father bought me a while back ., and a recipe for sweetcorn fritters. It reads far too easy yet really is easy! 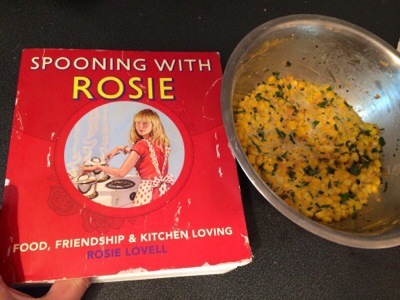 Rosie says no salt yet we had to add it after cooking for sure..
No spring onion so foraged in the garden for the growing chives and garlic tops .. Plus using the pimped roscoff oil really seemed to work . 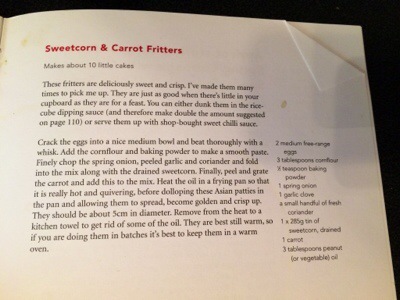 Mad easy recipe this.. Like far too frickin easy ! Take two eggs . Whoop them up.. Add the chopped chives and garlic tops.. With the addition of a can if the jolly green fella.. Then add three tablespoons of cornstarch.. A three quarter teaspoon of baking powder ( don’t go mixing those up now !) and fold everything together.. It WILL look far too runny ., yet it works. Just heat the small amount of oil . No shallow nor deep frying here. Flip when you hear them go pop. Serve with good store bought spring roll sauce .. And love them like we did! Great recipe . Pleased to re- read this book also.. Nice when that happens. Yet the true star just has to be the next course.. 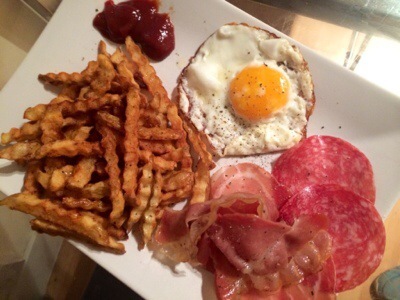 Egg and chips ala ‘shirley valentine 2014 ‘.. There is just something about egg and chips.. If you are from England at least! Perhaps more places In the world also value this wonderful staple .. ? Dunno.. I do though know that it’s a winner every time.. As a kid it was a fave and offered often when you went visiting ..
And if course you cannot forget the fabulous movie if shirley valentine … Shirley not. !! Not my link yet well worth a watch.. Just for the egg and chips piece! Well that was my nites supper., and it’s not even Tuesday ! Dressed it up a little .. The addition of Milano salami, prosciutto , and lomba.. A dollop of stokes ketchup . Yet took the king Edward and crinkle cutted him up.. Into a fresh batch of mrs Middletons oil .. No thrice cooking .. No need. No sir-eee.. This is easy supper after a day if gardening .. 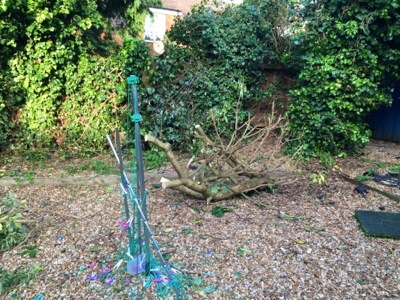 Chopped down a big ivy tree .. Ummm also squashed Mrs Fitz’s rotary washing line when it went timber.. Uh oh.. Not a happy bunny.. ;fresh washing was on the line prior .. Yeah.. Was and prior .. The pic shows it after the chaos occurred ! And the area cleared . Wish someone had filmed it. For sure woulda got a few hundred for it on a TV show! And I reckon a bunch of hits on YouTube ! DIY store tomorrow for a new version.. 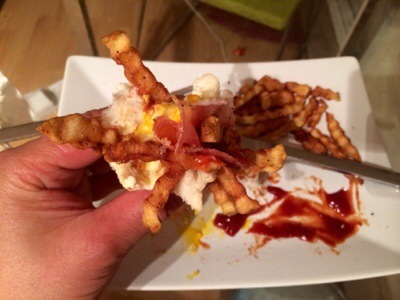 Egg and chips is great though.. I forget just how lovely food like this is sometimes ..
And a great innuendo! What more do you need from a cook book? Yeah.. And a great recipe for porchetta ribs also!